One of the time honored traditions in the MFZ community is copying other people's Frame designs. This allows you to field something you think is cool and possibly learn new techniques at the same time. 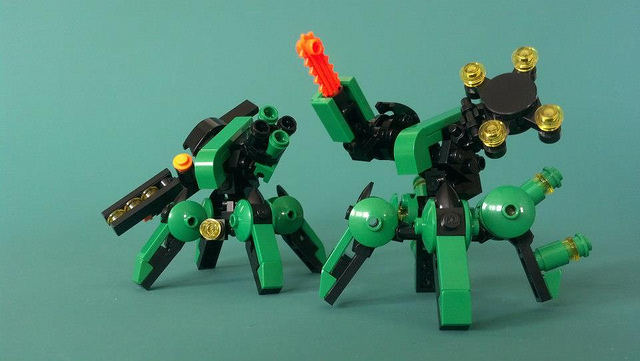 Another tradition in the community is copying ideas, concepts, and techniques from other builders and then combining them in new and interesting ways. That's the idea behind this Frame from Xenovirus. 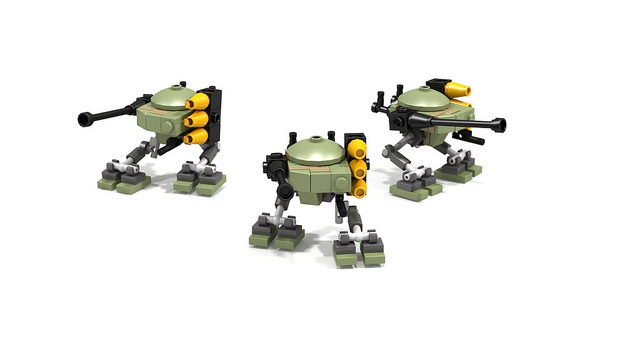 They're really cool looking and I've always wanted to take a crack at building one. But another idea occurred to me somewhere along the line. 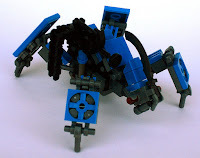 Somehow the idea for also using the torso from Mitten Ninja's Locust frame popped into my head. I'd already built something using that core, so I'm not sure why I wanted another crack at it. But I ran with it anyway. That led me to this, what I'm calling the Warstrider. There are more pictures in a Brickshelf gallery. you can get an idea of how big it is. After a month off, the Usual Suspects got together this past weekend. We tried a new table setting that I call "Teslaville". White Tank -- 2Rd+d8/2B/2W + SSR. Green Recon by Fire -- 2Ra+d8/2Y/2W + SSR. Red Recon by Fire -- 2Ra+d8/2Y/2W + SSR. Red Recon by Fire -- 2Ra+d8/2Y/2W. Occam's Spork (7 Frames & 27 Systems) = (3 Points per Asset) * (9 assets) = 27 points. Blue/Green Recon by Fire -- 2Ra+d8/2Y/2W. Blue Moving Wall -- 2B/2G+d8/2W + SSR (x3). Events of Turn 1 (DDC@11): Occam's Spork's Green frame closes in and hits my Red frame for 1. My Red frame hit's Tyler's White frame for 1. My Yellow frame, moving in from its position in the corner of the battle field, also hits Tyler's White frame for 1. Occam's Spork's White/Green frame hits my Orange frame for 1. My Orange frame moves off of my first Station and continues the attack on Tyler's White frame with 2 damage and also destroys the section of train track it was using as cover. Occam's Spork's Blue frame hits my Orange frame for 1, then seizes my first Station. Occam's Spork's Green/Blue frame hits Tyler's White frame for 4 damage, destroying it. Tyler's Red frame hits my Green frame for 1. My Green frame moves off of my second Station in an attempt to return fire but ends up short on range. Tyler's Green frame hits my Yellow frame for 1. my Blue frame turns and moves down the tracks towards Tyler's forces. Events of Turn 2 (DDC@7): Tyler's Red frame moves to the corner of the battlefield then hits my Green frame for 2 damage. My Green frame attempts to hit his Orange frame but only destroy the train track it was using as cover. My Orange frame maintains position and hits Occam's Spork's Blue frame for 1. Occam's Spork's Green frame hits my Red frame for 3. My Blue frame continues to move down the tracks towards Tyler's forces. Events of Turn 3 (DDC@3): Occam's Spork's Green/Blue frame hits my Yellow for 1. My Yellow frame continues to move towards Tyler's Stations. 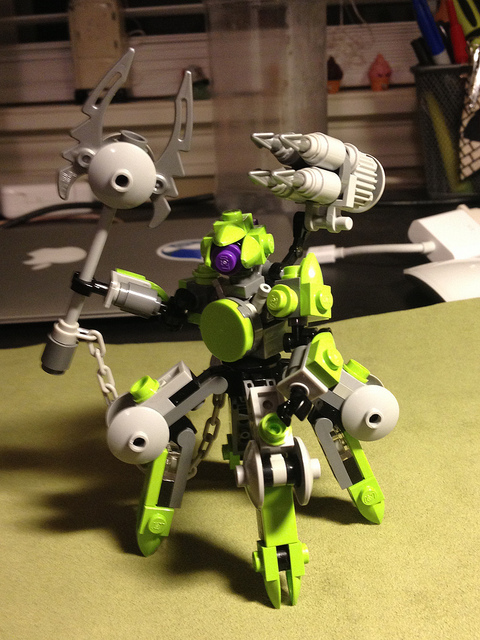 Occam's Spork's Green/White frame moves away from his Station and hits my Orange frame for 1. My Orange frame charges forward trying to pressure the frame guarding Tyler's Stations. Tyler's Green frame hits my Yellow frame for 4 damage, destroying it. Tyler's Orange frame hits my Blue frame for 1. My Blue frame moves forward to put more pressure on Tyler's Stations. The turn ends and I tick the clock down to zero, conceding the game. We decided each section of train track would take one Hit of Damage before being destroyed. I finally added Artillery attachments back into my squad. It was a mistake. I really needed another front line fighter, not a REMF. Not a really deadly game as only two Frames were destroyed. A fair amount of damage was dealt though. Not what I was intending to post today, but I ran out of time. Bag. I paid $3.99 for this at Toys'R'Us, for a $0.07 Price per Piece. Parts. A White Travis Brick, Minifig Stud Shooters, 1x2 Mod. Plate w/Bar (open ends), 1x2 Inverted Studless Slopes, a printed 2x1 Cheese Slope, and Lampholders are all fun parts. Build. A weak IO frigate. Score: +20 (A+). I'm not sure it deserves this score. Let's do a little something different for a review today. Box. MSRP is $5.99 which is a Price per Piece of $0.10. Parts 2. The Trans-Pink bricks are nice as are the 1x1 Mod. Bricks w/Handle. Apollo Studs in Gold are interesting too. Build. A couple of IO HVAs. Score: +5 (B+). Not sure this set deserves this score. 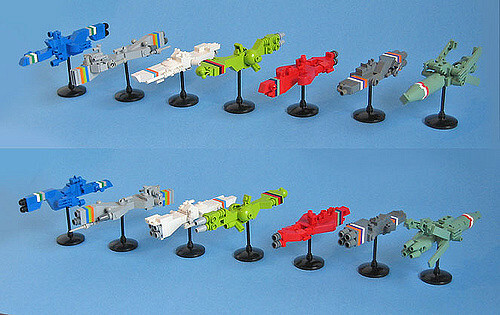 Let's finish out the week with some starships! range in size between Cruiser and Frigate length. but still a good one. Looks to be the proper length for a Cruiser. Dressed for Wargames... by nnenn. This is another old one. too long for Intercept Orbit but they look fantastic. 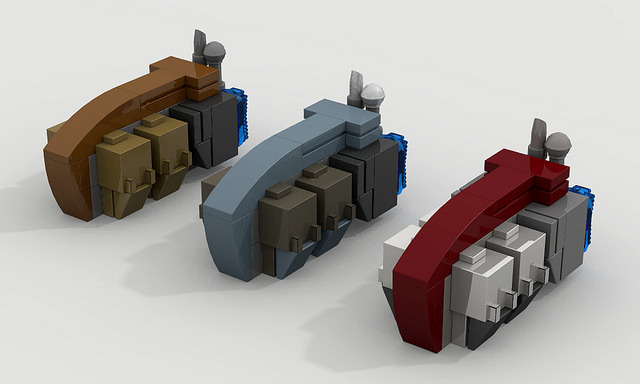 Tiny Freighters by essaych. Render. These would make great HVAs. looks to be Frigate length, and downloads are disabled. More pretty stuff for you to stare at this week. 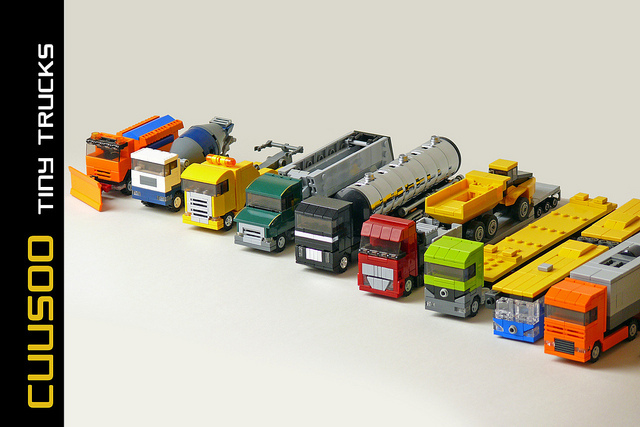 Tiny Trucks by Robiwan Kenobi. These look to be in 6P scale. is really neat, and downloads are disabled. so -- build that also has downloads disabled. more than 10 hits to destroy it. Again, downloads disabled. Vehicle Stuff by Sunder_59. 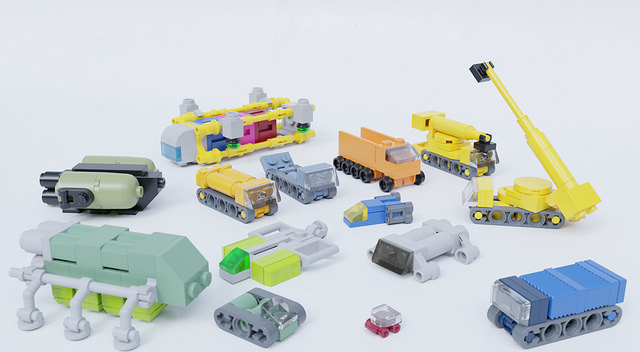 A nice selection of sci-fi vehicles in microscale. I'm feeling a little lazy this morning, so here are some neat pictures to stare at. 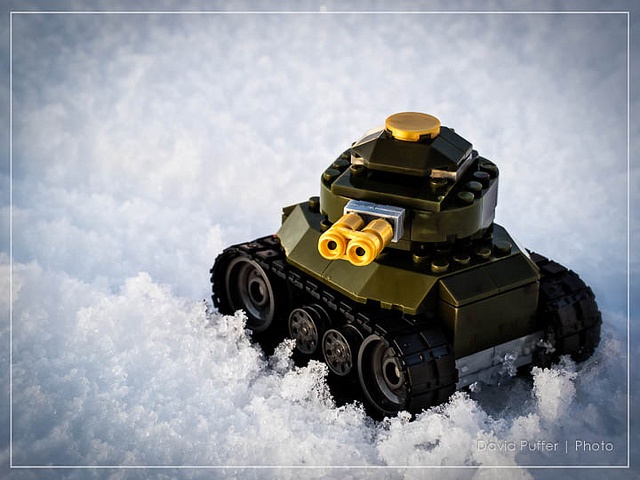 M729 Scarab by Nick Brick. Very nice. image by e.c. macCallum. Render. These are neat. this picture, and it's Mega Bloks too! Spiderling by Michael Raichelson. I like the colors and the intimidating look. 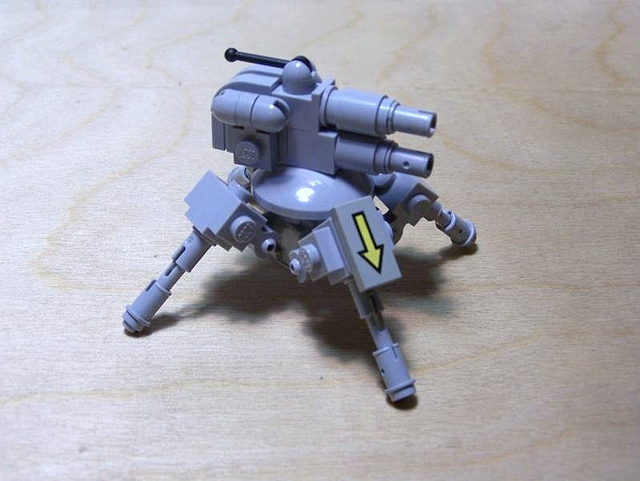 Let's finish out Mega Bloks week with something a little different. Box. MSRP is $14.99 which is a Price per Piece of $0.11. an Inverted 1x2 Cheese Slope. Parts 2. The Black 1x2x2 Slopes w/Step are pretty interesting. Slopes w/Hole are all interesting. are supposed to be Spock's Eyelids. Build. 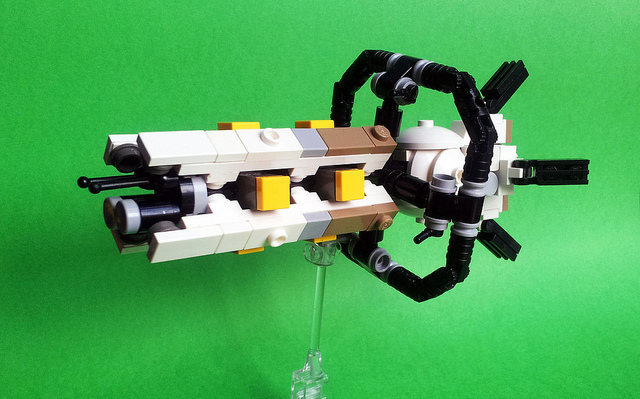 I managed an IO frigate after some time spent looking at the parts. Score: +5 (B+). This set has some really interesting pieces, but I feel that you'd need at least two of them to make something really good from it. Switching franchises yet again, let's continue with Mega Bloks week. Box. MSRP is $14.99 which is a Price per Piece of $0.18. center is too loose for a stud to attach. Parts 2. The Double Axle Holder in the upper right is really interesting. Plates and a 2x2 Bar Tile? Build. A little thin, but I think it works. Score: +5 (B+). About normal for a licensed set.